Enjoy Jumbo Gyoza at Tokyo! 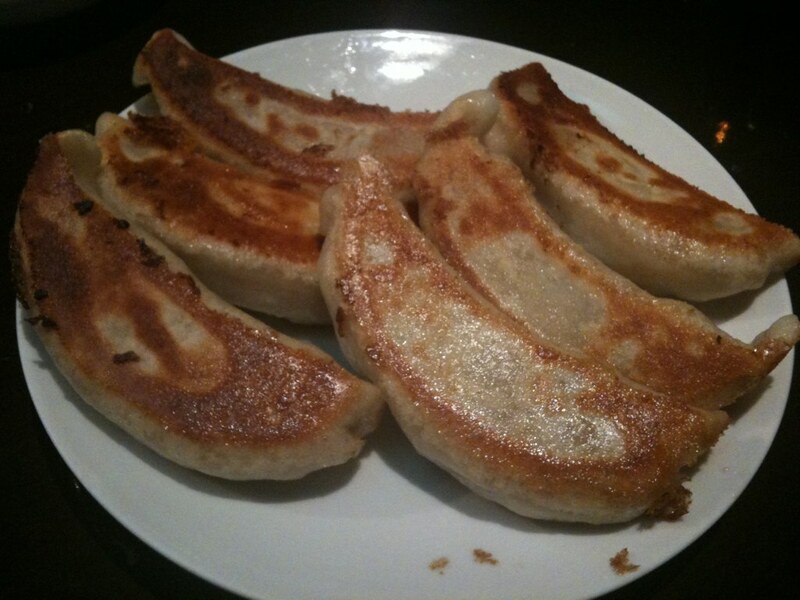 It seems as many people have the image of gyoza as a “bite-size appetizer”. Typical japanese Gyoza’s length is 7-8 cm, so it’s exactly the size for a one-bite snack. Some people may feel that eating these gyoza as an entree is not quite enough. 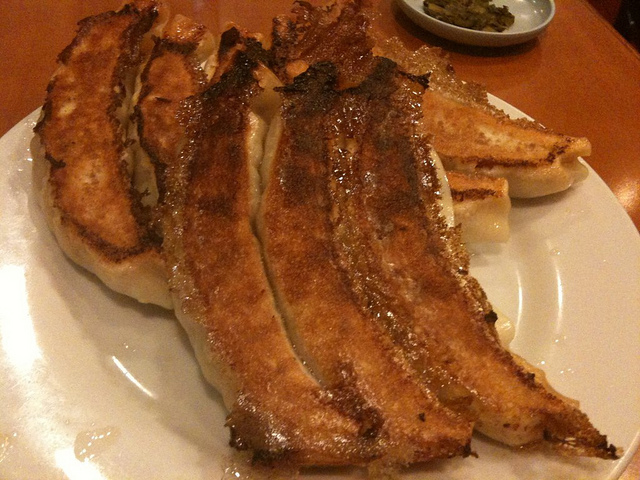 So today, I would like to introduce the top 3 popular jumbo gyoza restaurants in Tokyo, for people like you, who want to bite into much bigger gyoza. TAIKO-RO is a Chinese restaurant with a long history, founded by Mr. Yu in 1949. 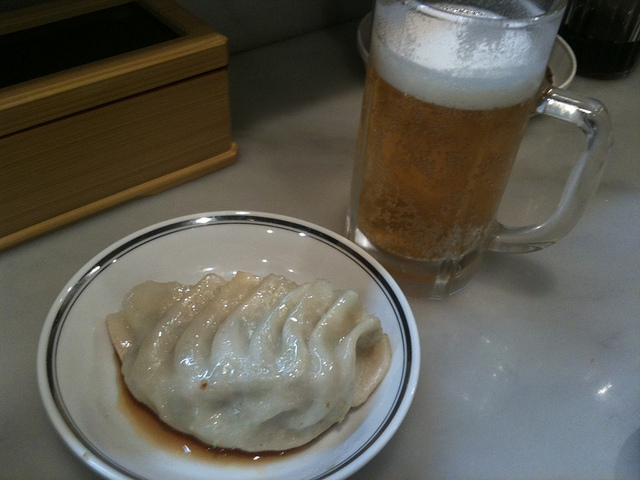 At about the beginning of the restaurant, following the advice of one of the customer from Manchuria he added gyoza in his menu. Taikourou’s gyoza is as long as 12 cm, like a banana! You can enjoy it more deliciously with the special TAIKO-RO’s C-Ba-Jang（C八醤）source. You can also enjoy jumbo gyoza steamed at TAIKO-RO. TENRYU is a famous jumbo gyoza restaurant, frequently shown on TV and magazines. There is always a long line of people waiting all day long. TENRYU’s gyoza is ever bigger than TAIKO-RO’s gyoza. They are made of a filling packed with vegetables, wrapped up in a large, thin pastry dough. The crispy texture at the bottom of cooked gyoza is just outstanding. The seasoning is very light so you can eat lots of them in one sitting. The filling also does not contain garlic, so they’re perfect for people who don’t like strong smell of garlic. SHORUY is a popular Chinese food spot, located in Ueno, Ame-yoko shopping arcade. There is always a line but the rotation of customers is fast so you can go inside after a short wait. SHORUY offer their gyoza at very reasonable price. Gyoza of this size are 450JPY for four. The dough is quite thick. You can enjoy both the chewy and crispy texture at once. The filling is mainly vegetables, lightly seasoned without garlic. It might not be a place with an atmosphere allowing to take time and enjoy the meal like TENRYU and TAIKO-RO, but it is a great place if you want to eata hearty meal of delicious gyoza.